The Annual General Meeting of the Mountain Club of Kenya will be held a Casual Bites/Westlands on Thursday April 20th at 8.30 pm. Please download the Agenda 2017. Hells Gate: Flash Gordon 21, 170 feet. Entrance Wall, right end. The climb is located a little to the right of the mini stone amphitheatre. Start at the bottom of a large vertical slab with a visible crack splitting its middle. Reach the the top of the pedestal and access the crack/corner with a bouldery move. Alex has cleaned there several decades of bird crap with a broom attached to a stick, add a grade if they have built it back. At the top of the slab, delicately head left under the block, then straight up on steep rock. Towards the end, a short (steep) detour on the right avoids a couple of meters of soft rock. 60m ropes are necessary for a solid belay at the top. Brilliant climb on great rock! New climb: Hells Gate: Bloodline 22, 175 feet. 1) Hells Gate: Bloodline 22, 175 feet. Left end of Fischer’s Cliffs almost directly opposite Fischer’s Tower. Start at a yellow wall where the cliff bulges out from a blunt rib (painted B.) Climb up ramp to a steep wall and corner crack, swing left and then back into notch. Up over roof, then up to the second roof which is taken from the left. Continue easier to the top. FFA Alex Fiksman August 11, 2013 (first ascent VS A2 Iain Allan and Roger Higgins September 13, 1968). 3) Frog: The Mexican Swine Line 22, 50 feet. 4) NFD Bodich: Twas Brillig 19 450 feet. Despite several past attempts, no successful ascent had been made of Bodich. A long and prickly approach to the base of a broken corner crack at the right side of vulture-dropping covered wall. Wear long sleeves and trousers made of thick thorn resistant cloth. Take plenty of water, several pangas, and start early. Pitch 1: Start is right of the prominent vegetated gully. Start climb behind huge menhir shaped boulder (scrambbling). Once up behind the boulder climb corner to where a sloping ledge breaks to the lest, ignore this ledge and continue up steepening corner past an old peg (left from a failed attempt in 1970s by Phil Snyder) to a hanging belay consisting of two bolts. Grade: 18 well protected. Large cams are useful. Pitch 3: Go straight up from the belay to make a commiting move past the overlap and climb the slabby wall. You will find lots of shaped holds and nut placements. Stay right of main corner and head for the small tree. Tree belay. Grade: 15 well protected. Above this tree a steep gully leads to the top. 5) Hells Gate. Infidel, 22 A2 , 250 feet. Springs Wall first impressions are that the grade is 22 A2, but we would be happy for a second ascent party to downgrade the difficulty. Will write up description, but anyone wanting to repeat the route, can contact me at any time. Three pitches, right-hand side of Springs Wall, through the left side of overhangs. Alex Fiksman and Julian Wright. October 1, 2011. 6) Hells Gate: Death-Proof 20, 250 feet. A sustained technical route of great value. Bring Four No. 1 Friends for P2. P1. Start fifteen feet right of Devil Drives, in a left facing crack. Jam up crack up to small roof. Step left and traverse for ten feet to enter a vertical gully. Up this and left to reach first belay of Devil drives. Up this to belay in corner under steep grey crack. P2. Lay-back and jam up crack, up over the protruding flake. Continue up easier to the end of grey rock to base of red shattered wall. Move left and up the final section of Devil Drives. Right side of west facing wall of Cat. The climb traverses under the obvious horizontal flake/overhang and then takes the obvious line up the middle of the “right ear” of the cat. Pitch 1: From the gully on the right (south) side of cat. Walk up until a traverse left below the flake/overhang can be made. Then up following a shallow crack system tending slightly leftwards. Belay on the obvious ledge below broken wall (50 m). Pitch 2: Up broken wall first heading up and left, then straight up to bush/tree. Belay just above in the chimney. (50 m). Pitch 3: Up the chimney to the top. Top out on the left of the chimney. (30 m). 8) Hells Gate: Skyfall, 19 A0 , 150 feet. Entrance Wall. About twenty feet right of Medicine Man, there is a crack that moves through a series of bulges. Around the first bulge from the left. Then up the second bulge pulling on gear. Continue up, exit on the right of the crack system. Entrance Wall. Start as per HIRETH (about 60 ft right of Phoenix Pinnacle where the rock turns from yellow to red is the remnants of a tree at 30 ft). Pitch 1: Climb over blocks to below a tree and just left of a wide crack. Use tree to gain ledges. This is where HIRETH goes up and left. Continue up and right over easier broken terrain to a corner 25 feet below a large roof. Pitch 2: Climb corner to roof which is surmounted direct. Step right and then back left onto sloping ledge. Continue slightly left until a crack on the right provides the airy finishing moves. Fine climbing on gear up to number four BD cam. Entrance Wall: Start about five feet right of “My Last Sigh” in a hand-jam crack. Climb crack to top of pillar. Continue up, moving right over broken terrain to the ledge at the base of a clean vertical crack in a recess. Surmount ledge and then up crack. Continue up to overhang, through this and up stem right to crack. Up this and finish left. This climb starts just to the right of the large overhang on the right of the tallest part of the crag, and the first pitch follows the crack which rises from the ground, R around the back of the overhanging bulge and up. P1 (4c, 20m) Clamber merrily over the loose rock to the right of the cracks. Continue carefully up the face above until a ledge can be reached on the left with a graceful slither. Comfy belay on top of fresh baboon offerings. P2 (4c, 15m) Leap off the prow of the ledge towards the friendly fist crack on the left. Gain a small ledge about 3m above the belay, and then make a big step right around the arete. Climb directly up arete to a big ledge with a massive cam placement, and then traverse right into the deep, welcoming chimney. Up chimney to top. This climb is on the South face of Olo Olokwe about 150 metres to the right of a route put up by Howell/Higgins July 68, mentioned in the MCK climbing northern Kenya handout. The highest part of shrub onto the face. Start up an obvious flake that works its way from left to right. There is limited protection at the top of the flake, unless you have very large camelots (#5-6). Sling obvious but somewhat sketchy horn at the top of the flake with a long enough runner to avoid pulling the sling off with rope drag. Pull out on to the face and climb towards any protection you can find. There are a couple placements for micro cams or TCUs, but they are sparse and have long run outs in between. Work out left on the face in order to find better protection, of which, there was very little. Causing the first ascensionist, to sling a tuft of grass for mental duct tape. Work back left on an easy but poorly protectable slab climbing aiming towards a lone palm tree. A perfect vertical crack above the tree provides solid placements for a gear anchor. Work up and right from the anchors on easy climbing that works its way towards obvious trees. Potential crack placements exist, if willing to excavate, but the climbing is easy enough to pretty well run it all the way to the trees. Work right after the second group of trees towards to a blocky section that provides decent protection. Take caution not to launch any of the loose blocks on this section and at the belay stance at an obvious ledge at the base of a gully. Start up the shallow groove from obvious ledge bearing right, the very slippy black surface will guide you in that direction anyway. After 20ft there are some options for protection, tap tap. Some are better than others. Once you’ve got some gear in move right onto an overhanging block, then up the face for 30ft. When you reach a vertical wall traverse right, some lovely exposure, after about 50ft you meet an obvious chimney, thrutch up enjoying some wonderful climbing until you reach a tree, placed perfectly at the base of a steep wall. Just above the tree are excellent bomber belay placements, your last ones!! Traverse right from the belay at an incline on loose shattered rock, little options for decent protection, reach the left hand side of the main wall. Then go up the vertical scree, wondering why are you not in Havanas having a cold beer instead. Until you belly flop onto a flat area with an obvious rock for safe belay. At this point the obvious rock revealed to be loose, as is everything around. This is after 6 hours climbing so a desicion was made to concentrate on getting down. This was a BODY belay tension traverse across to the left to a large tree..the wizards oasis. Then 4 full rope lengths rappel. Between Archers Post and the left turn for Wambi are 2 crags, the closer one to Archers Post is Water Hole Slabs. But there is another smaller crag further along behind the Olokwe Guest House. It’s never been climbed , as described to us by the Kalami Conservancy Representative, Dominic, so we had to take the plumb line.Drive back towards Archers post from the Olokwe Guest House, there is a dirt track after about 2 kms, turn right then after 20 mins of reasonable off roading you get as close as you can to the crag. Its North East facing so gets hot, we tried the night before but it was fettered with baboons so we came back in the early morning. The climb starts about centre of the crag on the bottom left point of a giant X. There is an obvious shallow which rises to the right, it looks like there is all the gear in the world but it all sound s like Big Ben/Liberty bell when tapped. Get some cams in anyway and move on, there is a rounded bulge to the right. Go over it and move up to the tree belay. From the tree belay go straight up, not the easy staircase to the right. Lots of great gear placements and nice warm up moves for about 5 metres. Then you start to get funnelled as the face becomes steep and gets sparse on holds, your forced right, across a small face into a groove, get some gear in here. Then there is a period of good 5.9 climbing, but with a great sequence. Get above this and whilst in a tight chimney get some strong hexes in before pushing out onto the left face, you naturally go up a crack, the crack becomes a groove, the groove becomes a gulley, then you top out onto a wonderful shelf to amazing views of the cat & mouse and Olokwe to the north. Start at bottom of leftward-rising corner, just before ground drops away leftwards. Climb below or in the corner (as vegetation allows) until corner reaches dodgy sapling on dusty ledge. From sapling, climb directly into scoop and up wall on hollow flakes. Climb the face between Millstone and Capstone. Worth the effort if you’re already wasting your time on Morning Wall. Start up the chimney on the right of Coffin. Ascend chimney and then rightward-trending gully to top. This line is more obvious than Coffin, so I’d be surprised if it hasn’t been climbed before. To the left of Coffin’s gully is a slab with a small overhang at 15′ and a bulge above it. Climb directly to overhang, then step left to surmount bulge. Straight up to ledge under roof. Traverse left past end of roof, and then follow gully rightwards to top. This climb’s actually alright, if a bit short. At left end of Mr. Cod’s slab is a shallow chimney which thins and shallowens as it rises until finishing about 20′ up. Climb chimney and then up crack to grassy ledge. Escape upwards through boulders and trees, and then join finishing gully of Mr. Cod. This is also not terrible, but the good bit is a bit short. Just to confirm, “The Road To Nowhere” is a project, it just happens to be a big one, we didn’t top out so we don’t get bagging rights. So if there are any keen, slightly loony climbers who want to finish this with me, or want to get it themselves, I give you the field my liege..
NFD: Mirage, South Face of Ololokwe. Grade: 20 A2, 1,300 feet. Alex Fiksman, Johannes Oos, April 19 & 20, 2014. After 32 hours on the face, 15 pitches, a forced bivi without much food or water: Ololokwe succumbs to two stubborn climbers. A full description will follow. Looking at the South Wall of Ololokwe from the junction of Wamba and Isiolo roads, there’s a prominent nose – seen as a profile – that protrudes from the face about two-thirds of the way up. This is about 50 to 60 metres left of the R. Chambers’/Mwengela traverse up the grassy ledges. The route starts at a right facing corner and comes up to the nose. It follows a series of corners and slabs to reach the headwall below the nose. Up to the nose and around its left to the top. Walk up and right to the top. Repeating groups should be able to complete the climb without an overnight bivouac. Start up an obvious flake that works its way from left to right. There is limited protection at the top of the flake, unless you have very large Camelot’s (#5-6). Use long runners to avoid rope drag. Pull out left on to the face and start a heady climb towards any protection you can find. There are a couple placements for micro cams or TCUs, but they are sparse. Work back right on a poorly protectable slab climbing aiming towards a lone palm tree. A perfect vertical crack above the tree provides solid placements for a gear anchor. Quite cheeky. Work up and right from the tree anchor on easy but flaky climbing that works its way towards obvious trees. Potential crack placements exist, if willing to excavate, but the climbing is easy enough to pretty well run it all the way to the trees. Proceed to a second group of trees. Work right towards to a blocky shelf that provides decent protection. Take caution not to launch any of the loose blocks on this section. Continue up from the shelf slight right to a small flake; be cautious of smaller loose blocks below flake. Traverse left of flake to anchor on the obvious blocky shelf. Move up and right onto a steep slab, which is followed, with no protection, up to the right until a move across right gains access to a chimney. This is followed to a large jammed block belay. Traverse right from the belay at an incline on loose shattered rock, little options for decent protection, reach the left hand side of the main wall. Then go up the vertical scree until you belly flop onto a flat area with an obvious rock for safe belay. Climb up to the left, either choosing easy loose or slightly harder better rock to its left. Reach a small wall with pockets for both gear and hands. Move up left and after a couple of nice mantel shelves traverse up left to belay. Move up from belay onto easy ground. Which is followed up and left through vegetation to a large flake belay in the middle of the left hand wall of the huge diedre. Approach the wall at a small shelf and proceed to traverse left 15 feet. Direct your gaze up the vertical wall and indulge your eyes in the glory revealed, protection & solid holds! Make your way up and left to the obvious tree and large boulder. As this is the first pitch to not crumble in your hands, take your time to relish in the climb. For those seeking exposure, grasp onto one of the many solid pink crystallized quartz clusters and glance downward from this vertical face to the 1000 feet view below. Move up left of the mini over hang and then pick your way up and left towards the tree lined corner of the bivvy site. Pitch 9 120ftm 4a/b Exit bivvy ledge on the left out onto the slabs. Traverse up and left on short rock walls and grassy ledges to below final steep rock wall. Balance up on good holds onto unprotected slabs above, which are followed to a good belay on a large block. Summit. About five meteres right of the original start, directly below the belay of Pitch 3 (original) there is an overhang at 4 metres. Up a slight undercut, then step right and back left under overhang which is taken from the left. Up into groove and continue directly to the belay of the original Pitch 3. At this point the original Pith 3 and 4 can be linked, thus producing a sustained two pitch adventure. NFD Bodich [Lebendera] The Belfry HVS 5a*** 420m FA Loren Hostetter and Duncan Francis, 15 Nov 14. The route is on the South Face of Bodich, also known as Lebendera, on the North bank of the Ewaso Ngir’o river, about 10km East of Archer’s Post. The mountain and cliffs can be seen from the main road. Note: the mountain is in a KDF training area, but this does not seem to be an issue. To get to Bodich, cross the river bridge heading North into Archer’s Post, then as soon as possible drop off the road to the right and double back on yourself. At a shack marked ‘garage’ turn left, then first right, then left again to pick up a track which generally follows the line of telegraph poles heading East. This eventually leads to a ford [often dry] across a tributary of the main river. Once across the ford, head right [South] on a decent track towards the main river. before reaching it, another track branches off to the left. Follow this, which gradually fades away as you get closer to the mountain. But persevere, as it does exist, and follow it to directly below the crags, which are some 800m away and uphill. Good campsites along the river. To get to the crag, head straight uphill through bush and rocks. The crag can be climbed on at any time of year. The rock is basement gneiss [I think…], the same as at Lukenia and Tsavo, and is generally sound and clean, although the first two pitches suffer from some bat pooh dribbles…… The route is reasonably protected throughout. The Lebendera Rulebook: We broke almost all of these. 1. There is a vague vehicle track along the North ban of the river. Trust me. 2. Go straight up to the crag from the river. Don’t try traversing in from the side. [ow, ow, ow, ow, prickly! Is it that time already?] 3. It takes a long time to go up and down. Take your head-torch, and batteries for your GPS so that you can find your way back in the dark, rather than scrabbling through acacia bushes and swearing a lot. 4. Bats have right of way, are very noisy, and pooh a lot. 5. Take plenty of water. 6. Don’t go climbing on Natorbe the next day. 7. There are tons of new routes to do, although some might need bolts [aaaagh!]. Start at the base of an obvious steep, kinked crack and chimney line in the vertical buttress left of the large slabby walls, and right of a broken ridge. 1. 40m 4c/5a Follow the crack all the way to a semi-hanging belay where the crack and chimney merge and tilt to the right. Many bats in the chimney to the right. 2. 45m 5a Up the crack under the roof, and then traverse out right to a vertical crack. This proves to be the back of a huge free-standing flake. Climb the crack [full of bats] and then the flake. Move up and right at the top to a wide shallow groove, climb this, and then back left to belay at blocks on a big ledge. 3. 50m. Scramble up the ridge to a cleft below a clean rib on the left. 4. 40m 4c The rib direct, to a belay below a stepped buttress above. 5. 35m 4a the stepped buttress and then the easier angled continuation ridge behind [easy] to a great belay on an acacia tree on a very pleasant leafy and shady ledge. 6. 50m 4c Climb the wall on the right, then make an airy step across a deep cleft [the top of a huge chimney] on to the wall behind. Climb this, moving up diagonally left higher up, and then up to belay below the next buttress, which has a gully/chimney on the right. 7. 50m 4c Climb the dark nose on the left edge of the gully/chimney, then up to a steep crack before moving up right past a tree and then back left. Scramble through gap between large boulders to belay at the back end of a big flat sandy ledge [excellent bivvy site!]. 8. 50m Scramble up across boulders, including an obvious leftwards slanting ledge on the front of a big block, to belay on trees below a cave. 9. 40m 5a Climb the short wall and fig tree root to the left of the cave, and then up the steep wall behind [fingery and exposed], trending left to belay at the top. Descent by abseil, mostly down the line of the route. 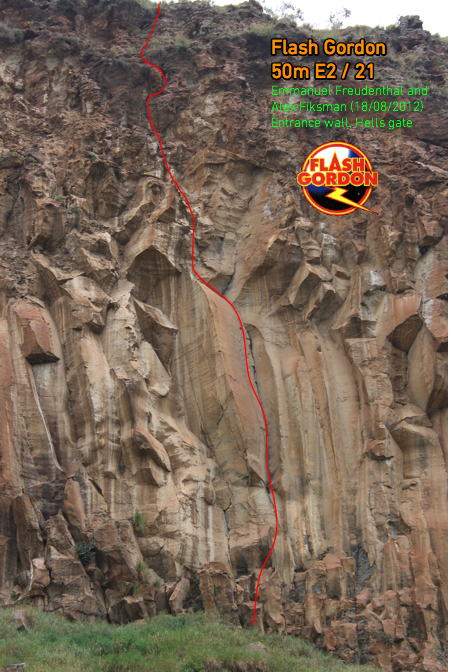 Final abseil [down the line of the first two pitches] is a full 60m with a stretch, and is mostly free hanging. To the left of Gold Rush Buttress there is a smaller buttress. Directly above this, a grey wall is split by a plumb crack ending under a roof. The climb surmounts the smaller buttress from the left, ascends the crack then breaks through the roof and finishes above. Carry two or three BD #3 and same for #1, more is better since the crack can be slippery even when its dry (a scientific marvel). P1. Left of the smaller buttress, some large left-facing blocks can be seen. The larger of the blocks form an overhanging fist crack. Start below this. Avoid the crack by climbing to its left and up to the top. Belay directly below the plumb crack. P2. Climb the crack to the roof. It may be possible to break through the roof and belay above if gear and energy permit. P3. Climb the roof directly through the main crack. Exit to its right. Then meander right, then left towards a point on the let side of the prominent point jetting out on the skyline. Do not look for difficulties or placements for your gear. Note: After the Gold Rush exits to the right of the point mentioned above.